yesterday i vacumned up my foot pedal cord--so frustrating. i won't be sewing for a while. hopefully the cord can be replaced, and not the entire foot, they can be pretty spendy. Ouch, what a bummer! I hope you can get it taken care of quick! I did that with my hair dryer once and the electrician just rewired it - not too spendy. good luck! ps. lovin your wagon wheel quilt, so cute. what a lucky babe you have. That is so frustrating. I hope it ends up being a quick and easy fix. Oh that is not fun! I'm pretty sure that it can be replaced without buying a new one. *hee* Having no proper sense (as my grandfather used to say), I'd do the same thing as Suzanne - tape it up and keep on trucking! However, I'm sure yours is the far wiser course. :) On that note, I'm pretty sure you can easily have foot pedal re-wired (we have people who do that sort of thing here), and likely at not too great a cost! Definitely take it to an electrician (I usually use the Mom 'n Pop place here in town). I did the same thing about 6 years ago and Viking wanted over $100 to replace the pedal; the electrician put a new cord on for about $15.00. Good luck! Seriously, what WERE you doing with the vacuum?? Making the rest of us look bad?? I've learned to live amongst the scraps and the threads. And I like it that way! HAHA!! Hope it's fixed soon!! Resist the urge to clean! ohhhh! that is terrible!! i hope you're able to fix it soon, and for a reasonable price. I think I just found another excuse for not vacuuming. After all, my husband has lots of electronics with lots of cords running around the furniture. I wouldn't want to damage any of it, would I? No, that's far to much responsibility; he'll just have to do the vacuuming from now on. oh, ouch. My kitty cat has been chewing mine, and seriously, if she doesn't knock it off before that foot pedal ceases working she is going to be one sorry cat. I feel your pain and i'm sorry! but your Wagon Wheels is beautiful! PS ... maybe i should try that to get out of working on this quilt that is driving me nuts! OH NO!!! Maybe it is a good thing that I have to use the hose and attachment in my sewing room. Hubby hates how the threads get all tangled on the bruses and belt. Blessing in disguise I guess. There you go! You'll think twice before vacuuming again! - I hope the cord is quick, easy (and cheap!) to replace! I'm still drooling over your American Jane rail fence...so dreamy! Good Luck, I am so sorry but maybe this will give you some time to do something that you have been missing. You vacuumed over the wire. Thank you for sharing - I usually do it too but now will put it up away from the vacuum. oh no! I am soooo sorry! I hope it ends up being an easy fix! S do you suggest i must avoid vacuuming at all costs then? I would try to wrap it in electrical tape and keep going. Not sure that it is a wise choice. How did you manage to get that done with the vacuum cleaner? Poor you, I hope it will be mend soon! Always said vacuuming was too dangerous an activity for a woman to undertake. I knew it all along! Do not vacuum, it just isn't safe! I hope you are back in action again real soon. I thoroughly enjoy reading your blog. Thanks! How horrible; hope you get your replacement soon! Hope Amanda Elizabeth has your replacement in waiting... otherwise, I'd wrap the wires separately in electrical tape and then together to seal it, see if that works. OMG! I would have been devistated, you seem to have taken it well. I love the wagon whell quilt btw, fantastic. oh no! i think that's worse than what i did today. i hope the cord can be replaced! I hope you get the replacement for the wire easily. Looks like my puppy visited your house. That is what she did to my pedal cord...cost me $110 to replace it!! Sure hope yours is more reasonable! 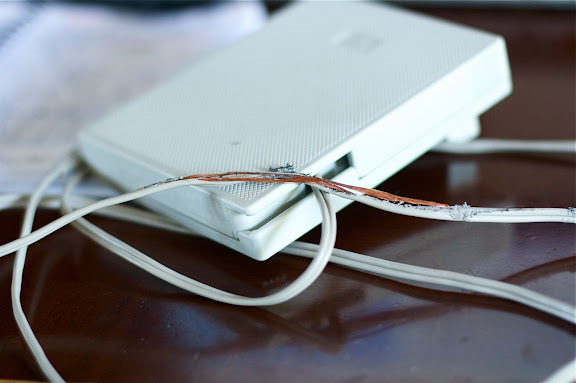 Hope you get your machine fixed up soon - or you could do it yourself, use those electrial connectors after you cut and clean up the wires -- it will be slightly shorter, but should work. Congrats, I love the new layout, the use of tags is great . NICE! Sorry I laughed, that is exactly the sort of thing I would do. Like so many of your commenters said, that proofs it - no good can come from doing the housework - I'll be showing it to Hubby tonight. Seriously though, hope you've managed to sort it out (cheaply). I had a similar incident and used some electrical tape only problem is it doesn't retract into the pedal anymore. 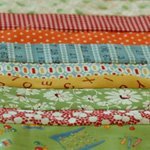 I love your quilts, thanks for sharing. Sorry about the pedal, just take the waiting time it will take to get fixed as thinking time for new proyects. Bad thigs happen for a good reason.